An interesting study published in The Journal of Cosmetic Dermatology caught my eye recently, which examined the effect on healthy facial bacteria of cosmetic preservatives. You can see an abstract summary here. The five preservatives tested were methylisothiazolinone (or MI, a major cosmetic allergen in which I have a special interest), ethylhexylglycerin and phenoxyethanol (both quite common in more natural-leaning cosmetics), and methylparaben (a parabens preservative, common in high-street and mainstream cosmetics, but avoided by some for unproven health concerns). The fifth was iodopropynyl butylcarbamate, which I have not come across much in British cosmetics, but may be more prevalent than I imagine. As the job of preservatives is to kill or at least inhibit the proliferation of bad bacteria so that your cosmetics do not go ‘off’, it is hardly surprising that they tend to have a similar effect on the beneficial bacteria which make a home for themselves on your skin, and which are key for dermatological health. The researchers found that all five preservatives “inhibited survival” of the nine facial resident bacteria isolates tested, when tested at the maximum allowed limit. Skin bacteria balance has an impact on acne and symptoms of eczema … could the preservatives used in topical preparations (both cosmetic and medicinal) be having detrimental effects on the skin health of those using them? Should we be avoiding water-based — and hence preservative-containing — facial skin creams in favour of oil/wax-based balms instead, to get around the problem of potentially negatively impacting our skin’s healthy microbiome? Should we be researching probiotic-rich skincare? Essentially, replacing the healthy bacteria lost on our skin with fresh colonies from a jar? I’m intrigued as to where this subject could lead us, and whether tailored solutions could be the way forward, perhaps based on research into our own personal skin microbiome, in order to indicate which preservatives we should avoid in order to reduce the impact on our good bacteria. Or even tailored probiotic skincare, with bespoke creams inoculated with your own personalised mixture of healthy bacterial strains, ideally cultured for your own skin. 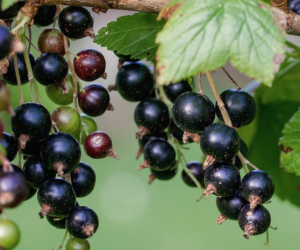 We were intrigued recently to learn of the development of a ‘Ribena’ hair dye, made from the skins of blackcurrants who’ve given up their juice to make the popular British cordial and would otherwise be disposed of. Read the Telegraph’s report here. The new technology exploits the fruit’s colourful antioxidants’ ability to bind to protein in hair, leading to intense blues, purples and reds, and when combined with yellow, also to browns. Apparently, the dye can last for around 12 washes or more – which sounds longer than, for example, dyes made from henna, indigo, beetroot and other plant dye blends. The scientific team from Leeds who have developed it have launched a spin-off company called Keracol and plan to launch the dyes onto the market in the late summer. It will be very interesting to see how ‘free from’ the hair dyes turn out to be. As they can only be semi-permanent, they will be free from PPD, which is only found in permanent hair dyes, which can cause extreme allergic reactions, and about which we have written a lot on the Skins Matter site — see here for Michelle’s analysis, and see here for Alex’s round-up of PPD free brands — but whether ‘free from’ other ingredients (as pure henna dyes are) remains to be seen. A lot of hair dyes may be free from PPD, but can contain fragrance allergens, preservative allergens such as methylisothiazolinone, and ingredients such as ammonia and peroxide which some women wish to avoid. In the effort to come up with a permanent solution to the PPD problem, Procter & Gamble have been working on and have now patented an alternative called ME+, which is less likely to allergically sensitise women who like to dye their hair. 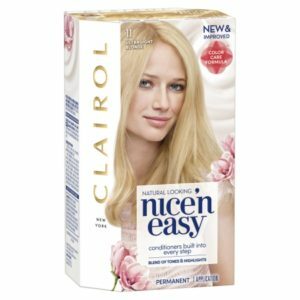 They’re using it in their new Nice ‘N Easy Hair Color formula and in their marketing campaigns have described ME+ — which is still a form of PPD, and has full name ME-PPD, or 2-methoxymethyl-p-phenylenediamine — as an “allergy gentle molecule”. Whether or not this is a reasonable description is up for debate. Around a third of women allergic to PPD cannot tolerate ME-PPD, and there are other allergenic ingredients in the hair dye in which it is used, so consumers should still take a lot of care about the ingredients, and their particular allergens, and to look for any reassurance from free from labelling. To read more about the so-called allergy gentle molecule, and the ingredients of the Nice ‘N Easy, see Alex’s article here. 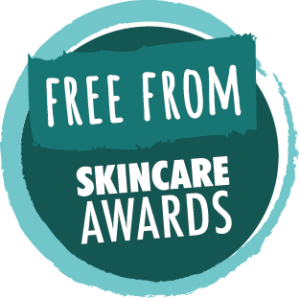 As most readers will know, we’re just about to start our second phase of judging for the Free From Skincare Awards, with expert judging panels considering the provisional shortlist of products, as decided by our testers. Sadly, we didn’t have any hair dyes entered into the category this year — though if this is a developing area, as it appears to be, perhaps we’ll see some blackcurrant-containing entries next year? — but what we did have were a number of very interesting shampoos, conditioners and hair treatments. We’ll be judging the entries this Friday, and we’ll be keeping an eye on any interesting free from claims, and whether ‘gluten free’ is among them. You may have noticed the Herbal Essences Bio Renew ad recently, which is causing a bit of controversy for making a prominent ‘no gluten’ claim in its marketing and its packaging. Is this a reasonable reassurance to those who want or need to avoid wheat or gluten — or is it merely jumping on a bandwagon of anti-gluten marketing? The answer isn’t a straightforward one, and touches upon our beliefs as to what good free from cosmetics labelling should be about — and what it shouldn’t be about. If you want to know more about Herbal Essences Bio Renew and gluten-free shampoo in general, you can read Alex’s recent post here. Some of our judges will have slightly different views, no doubt, so it will be interesting to hear what they have to say about free from labelling this week during judging — and of course how it impacts on the results! We’ll be keeping you updated through social media, so do follow and engage if you can! You can find us on Twitter, on Facebook, and on Instagram. 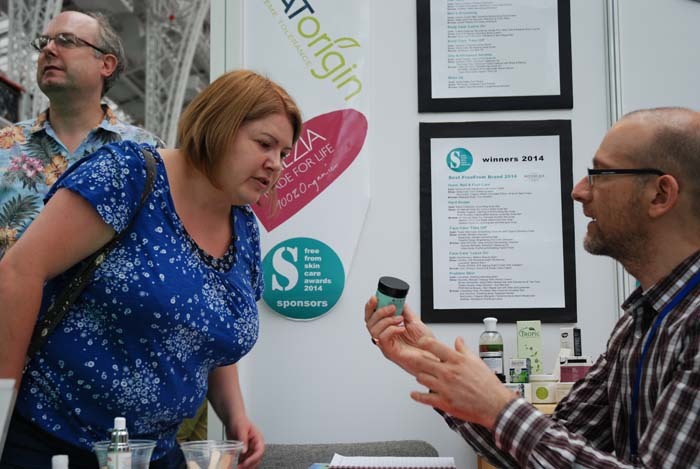 For the second year running we were delighted to welcome back Formula Botanica – the Online Organic Cosmetic Science School to judge in the FreeFrom Skincare Awards – and this year we also welcomed them back as official partners to the Awards too! Formula Botanica was founded in 2012, was accredited by the Open & Distance Learning Quality Council in 2015, and today has close to 2,000 students and graduates in 94 countries. There are ten digital courses at present, all 100% online, which you can study at your own pace in your own time. The courses teach everything you need to know in order to go from complete beginner to organic cosmetic formulator and teacher. Whether you’re an established brand looking to learn advanced organic formulation skills, or a small brand looking to start a new business creating organic beauty and skincare products, Formula Botanica has something to offer you. Their innovative eLearning platform gives you the theoretical and practical skills you need to make high performance organic skincare that is safe, stable and sellable. Many of Formula Botanica’s graduates have used their courses to successfully launch or grow their own cosmetics business. They fly the flag for organic and natural skincare all over the world and are ambassadors for a healthier way of life. To find out more about Formula Botanica’s online organic cosmetic science courses visit www.formulabotanica.com, email hello@formulabotanica.com or call +44 (0) 800 011 9545. Where’s the real fear when it comes to ‘free from’ skincare? ‘Free-from claims are based on fear and should stop‘ reads the headline of a report from Cosmetics Design Europe, which is drawn from remarks made by an industry panel at a recent In-Cosmetics Summit meeting. Are they? I don’t read ‘free from animal derivatives’ and quake in my shoes. ‘Alcohol free’ is not a message which incites the fight or flight reflex in me. ‘Free from artificial fragrances’? I remain free from trembles. More to the point, none of these messages give me the impression that animal derivatives, alcohol in cosmetics, or artificial fragrances are unsafe, as the CTPA, and other commenters in the article, appear to assume applies across the board. To criticise a labelling term – a mere expression of English – is to fail to recognise (or perhaps admit to) the actual problem. That problem is the abuse or arguable misuse of the ‘free from’ term, not its existence. Examples? The nonsensical ‘free from chemicals’, for instance. The alarmist ‘toxin free’. The lazy ‘free from nasties’. We disapprove of all. Other examples are perhaps subtler. We are uncertain about ostentatious displays of ‘free from’ labelling that could be argued to be capitalising on trends or public misunderstanding. For instance, while we support ‘gluten free’ labelling on skincare on the basis that many are genuinely concerned about it, on balance we feel it would be better incorporated discretely among other free from messages, which is why we had mostly positive, but not exclusively positive, views about the launch of a gluten-free skincare line last year. What about parabens? This preservative is the one that appears to get the industry’s back up the most; it’s the homeopathy of the skincare world, that polarises like no other. We have no reason to believe those approved for cosmetic use are not safe within the limits permitted, but recognise that many wish to avoid them. We neither approve of parabens scare-mongering, nor can criticise brands for excluding them. Most importantly, as far as we’re concerned, is the fact that you can be allergic to parabens: they appear on key contact dermatitis testing panels. Why is industry ignoring those with allergy? And it is because of the subject of allergy that we are most frustrated at the comments made. Judging by the article, the importance of free from labelling to those who react to skincare ingredients was not taken into account at all. Neither were the views of those with religious, ethical or environmental sensibilities acknowledged – for whom such expressions as ‘free from alcohol’ and ‘free from animal derivatives’ and ‘free from petrochemicals’ are invaluable. None of these is about fear. A ‘nut free’ message on either food or cosmetics does not send the non-allergic individual into a Macadamia-induced panic attack. We all recognise that that notification is not meant for us. As they are the ones who seem so concerned about it, perhaps the mainstream cosmetics industry and their representative trade bodies should focus their efforts on education: on who ‘free from’ labelling is for, and who it is not for. While they’re about it, perhaps some education is required closer to home, given the past president of the UK Society of Cosmetics Scientists’ baffling claim that ” … a free-from claim is not a scientific one” – which is an insult to any skincare brands who submit their products for laboratory (yes, science-based) testing in order to demonstrate and support a particular ‘free from’ status. Criticising the system merely punishes those who find it invaluable as a shortcut to ploughing through sometimes impenetrable lengthy lists of ingredients. Tarring the whole of ‘free from’ with a brush of fear is an arrogant stance to take: a blinkered position that blindingly supports the big guys over the small guys, the mass consumer over the niche or allergic consumer. The latter are not always afraid: they’re concerned only with living their life healthily and as they choose. ‘Free from’ helps them, and we support it. In reality, the only real fear I sniff in all this is that of an industry seemingly fearful that small brands producing ethical, natural and ‘free from’ products are gaining an increasing foothold in consumer consciousness. What’s that all about, I wonder? Two of my favourite food ingredients have been in my thoughts a bit lately – but not in a culinary capacity! Our poor reader is not wrong. Coconut derived ingredients turn up in a vast range of products, both ‘free from’ and high street. The ingredients themselves often have ‘coco’ in their name, and include or may include capryl glycol, cetearyl glucoside, cocomidopropyl betaine, glyceryl cocoate, sodium coco-sulphate and many others. It’s hardly surprising that ‘free from’ skincare manufacturers are so keen: coconut is an excellent ingredient in its own right, with very low allergenicity, and its many derivatives have many useful skincare properties. Coconut Prawn Curry: Do not apply to skin! All we could come up with on first examination was Neal’s Yard Remedies Calendula and Oat Body Lotion – which looks to be a beautiful product – albeit a little on the pricey side. It’s not easy to confirm coconut-free status from a mere inspection of ingredients, as many of those which appear can be coconut-derived, or derived from other botanicals. Happily, our reader came across a brand we’d not heard of – called Mistry’s – whose head offices, coincidentally, are just a few minutes’ walk from our offices in Hampstead. They seem to have a number of coconut-free products, including – assuming the given ingredients list is complete – this shampoo, which also appears to be wheat-free. And from one highly unreactive ingredient to a considerably reactive one, with this news from the Daily Mail recently that a molecule from the shells of prawns could be used to derive an ingredient to replace the petrochemically-derived polymers used in some conventional shampoos and cosmetics (as thickeners and preservatives). The natural polymer comes from a substance called chitin in the prawn shells. Sounds interesting, but, as ever, there are consequences, both actual and potential. Their use would exclude vegans and vegetarians – many of whom would be strong supporters of more environmentally friendly ingrdients – and they would not be Kosher. From an allergy perspective, those allergic to crustaceans would naturally be nervous – would there be a risk, or would the materials be purified and free from allergenic proteins? These cases seem to me to be a useful reminder that there are pros and cons to all ingredients used in skincare – and what might be a boon to one consumer, might introduce problems for another. No ingredient is safe for absolutely everyone; no ingredient is a cosmetic Kryptonite for all. Even the move towards restricting or banning methylisothiazolinone (MI) – which we reported on recently – will probably negatively effect some – by introducing alternative preservatives, which no doubt some consumers will react to. Meanwhile, all this talk of these two ingredients has rather put me in mind of a nice prawn curry …. How much ingredients information is too much? Cosmetic Scientist Colin of Colin’s Beauty Pages has just posted a very interesting blog about an Australian brand’s particular product label. In it, he wonders about their marketing claims and imprecise use of the word chemical, but what interested us more was his point that the ingredients list seems needlessly overwritten – particularly with repeated use of the word PLANT in brackets after certain ingredients – especially fragrance allergens. This, he points out, can make it more difficult for those who need to avoid certain ingredients, to spot them in a (longer) list. It’s easy to forget that ingredients lists haven’t always been compulsory on skincare products, and that their introduction was a huge help to those with allergies to cosmetic ingredients. Later introduction of law compelling certain fragrance allergens to be listed further helped those with known fragrance allergies. Obviously allergy is a chief interest of ours – right across our various Awards and indeed our ‘Matter’ sites – but we have come to realise increasingly as time goes on that free from living is about so much more these days than just reactions and sensitivities – it’s about ethics, about environmentalism, about personal choice, about non-allergic health considerations, about lifestyle, about religious sensibilities – so much so that labelling has become incredibly helpful to people other than those who react to ingredients, as important as these consumers naturally are. Sarah (of the Sugarpuffish blog) and Alex examining some labelling at the Allergy and FreeFrom Show 2014! Labelling should be in INCI format in the EU – but in our experience it isn’t always, especially on products by the smaller or newer brands – and although we support it it we acknowledge it isn’t always the most user-friendly. All that Latin! We like that some brands – such as Odylique and Tropic – also list ‘plain English’ versions of their ingredients on their packaging, as this can be very helpful, especially to non-sensitive consumers, who simply – and quite reasonably – want to know what is in the products they use on their bodies. Those of you who have food allergies or intolerances may be aware that the way food allergens are conveyed on prepackaged foods has recently changed. Now, the 14 food allergens – which include milk, peanuts, nuts and cereals containing gluten – must be highlighted in some way on ingredients lists. This highlighting is usually bold, but it can also be underlining or using capital letters, or indeed a combination of various styles. Despite some early concern and reticence from the food sensitive community, it seems many are now warming to the new style – although it will take some months to ‘bed in’. I wonder whether something similar is or will eventually be needed in skincare and cosmetic labelling? This would, in theory, help highlight the ingredients those who react need to avoid. The problem is that, in food, there are only 14 key allergens, but in skincare, there are 26 fragrance allergens – with recommendations that these should be increased substantially – and other ingredients which arguably should be added to any future list of highlightable allergens – not least, the isothiazolinones. I think where we draw the line between too much information and not enough information is a tough one. The more information you add to labelling – not necessarily to the list of ingredients, but anywhere on the packaging – the trickier and slightly more time consuming you make any single piece of information to find. Legislating all this is difficult, and – as we know from running the FreeFrom Skincare Awards – judging who has the balance just right is a very difficult one too. Anyone have any great suggestions? Facts, half-truths, myths – do we know what’s what in ‘free from’ skincare? The subject of fact in natural skincare is something Michelle and I think about a lot as editors of the SkinsMatter.com site – we want to bring you accurate information, after all – but getting to the bottom of certain issues can be hard, and time consuming. It may not even be possible. Are ‘facts’ facts, half truths or myths? Often, the answer depends on who is assessing them, and the information which they use – and dismiss – to reach a conclusion. None of us is right 100% of the time, and our contributors may see things differently to either or both of us, and to our other contributors. 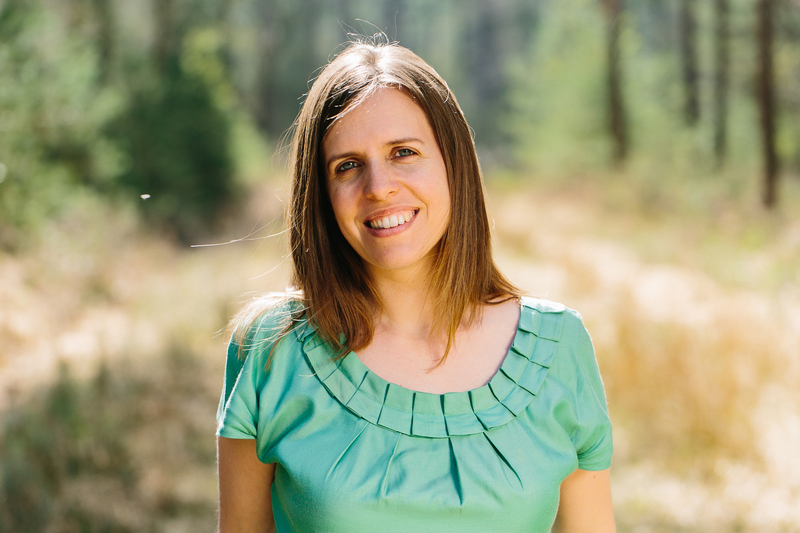 Micki Rose, one of our most dedicated and valued ones, regularly – and graciously – puts up with my disagreements with some of her views, and Michelle and I don’t necessarily see eye-to-eye on science and alternative therapies either. It doesn’t mean we can’t work together. The three of us happen to be great friends. Recently, Natracare tweeted us a link to a video. I watched it. You can do so here. It turned out to be their own video, warning how make-up wipes “can leave your skin covered in toxic chemicals that dermatologists agree are bad for your skin”. Some of the content, which is clearly aimed at women who use conventional products, concerned me and made me think more deeply about issues in skincare and health. I asked Natracare if they could tell me who the purported in-agreement dermatologists were. They didn’t, but founder Susie Hewson did tell me that their source was the Environmental Working Group and, specifically, the information from the Dirty Thirty cosmetics campaign, initiated by Teens Turning Green and supported by EWG. Unpicking every chemical and the evidence supplied for its so-called toxicity or generic ‘badness’ is an impossible task. And this is a key problem. Who has the energy and time to prove or disprove definitively? There are thousands of ingredients used in skincare – and the qualities and safety of so many are disputed. One organisation or expert says one thing; another, the opposite. Studies are only as useful as the interpretations are accurate – and these are by nature subjective anyway. There are claims; there are counter-claims. Those in the middle end up confused and disengaged. We know some ingredients have larger question marks over them than others – and we exclude these within the Free From Skincare Awards criteria – but disagreements about others can be sanity-testing and paralysing for us, and the consumer. Who agrees with the EWG? It doesn’t take a lot of online detective work to determine that dermatologists are far from in agreement with the EWG over the chemicals which routinely exercise them. Here’s the Center for Accountability in Science, reporting on the dermatologists who disagree strongly with EWG’s assessment of sunscreen products, and here’s another highly critical analysis from the Centre for Organizational Research and Education. To be clear, this isn’t to wholly dismiss the EWG – we have used their Skin Deep resource ourselves, and it has its uses if you approach it with the precaution that the science may not always be the most secure – but the point is this: EWG has its critics. A lot of them. And dermatologists are in no conceivable way in broad agreement with them. Natracare’s other claim that “everything you put on the skin gets absorbed into the body” seems at odds with how the skin works. Our friend and Award judge Sarah at Sugarpuffish recently blogged about whether we absorb 60% of what we put on our skin. In so doing, she reminded me of a terrific blog by Lorraine Dallmeier from Herb and Hedgerow, and drew our attention to another exceptional (and often funny) post from Siam Botanicals’ Polly Fox. All posts are worth your time. In case there’s any doubt, we really are fans of Natracare products. We have told our readers about them many times before, we feature them on our site, and Micki is presently working on an investigative piece on feminine hygiene, which will no doubt include them and their many exceptional natural and organic qualities. But I struggle with messages which appear designed to instil fear in consumers. Natural ingredients and cosmetics are great not because they’re not ‘toxic’. They’re great because they’re great, and using them offers many benefits, not least ethical and environmental. Can’t we hear more about that, please? Can we not win people over that way? I have lost count of the number of press releases we at Skins Matter have received over the years containing variations of the above sentence. Quite often a first-time pregnancy seems to be the life trigger for a new ‘free from’ formulator to get cracking in her natural cosmetic laboratory, but sometimes it’ll be a newly developed skin sensitivity, perhaps in one of her children. Either way, I’m afraid we’ve rather reached the point of no return with such claims. If you are unable to find ‘free from’ skincare products in the market, then I’m afraid you can’t possibly have looked very hard. There are countless natural cosmetics producers, both large and small, now in business – we feature hundreds of them in our Skins Matter Directories – and our master mailing list contains 800 brands, these being just from UK and Ireland. Bloggers such as Sugarpuffish uncover new small producers on a weekly if not daily basis, and tend to cast their net wider, including to North America and mainland Europe, where thousands of other brands lie waiting to be discovered. Natural health stores carry shelves groaning with ‘free from’ skincare, and supermarkets such as Waitrose are starting to increasingly stock them. So why, when launching a new brand, do their founders so often deny that all of the above exists? It was believable perhaps six, seven years ago; but is believable no longer. Manufacturers: honesty is your selling point in this market. Honesty in ingredients, honesty in their derivation, honesty in absent ingredients, honesty in your promise of ethical values. So why risk all that with a spurious claim in your marketing material? I wonder whether new start-ups make such claims because they don’t want to be seen as following the herd? By denying any bandwagon exists, do they feel protected from accusations of trying to hop on board it? It would be a pity if this were so, as, although ‘free from’ is expanding hugely, from our experience of running various free from food sites, there is always, always room for an innovative brand for consumers to get excited about. Ilumi is a good recent example: a brand with a wide range of products, including lots of ambient long-life ready meals for the store cupboard, which are free of all key food allergens. Bloggers and food allergics have mainly welcomed them with open arms, and I’ve yet to see any bandwagon accusation levelled at them. Let’s be clear here: we do want to see more launches, more innovation, more products on the market, more growth in ‘free from’ skincare, as well as more consumer literacy on the subject of cosmetic ingredients. We love ‘free from’ skincare and we care about ingredients. We’re thrilled when a new brand launches, and only wish them well. But making as if you’re unique for shunning petrochemicals or one of a rare breed for side-stepping parabens is a foolish marketing manoeuvre, which insults clued-up journalists, natural beauty bloggers, ethical consumers and, yes, competitors too. It’s a big, huge market – embrace that reality and try to find some other reason why your products have arrived. Your sales pitch should concern your brand and your products, not the imagined inadequacy of the competition. Have a strong USP – or even a YouSP, in that it should be about You and Your brand. If you’re claiming your range is so good, that’s great – you have to believe in the products, after all – but tell us why it’s so good. Tell us about those terrific ingredients, those ethical values, those ‘free from’ qualities which will be such a help to those with skincare sensitivities. Please don’t tell us how supposedly empty or uninspiring the market is, when it quite transparently has never been healthier. Can it really be allergy free, ‘nasties’ free or chemical free? One of our minor pet peeves at Skins Matter is manufacturers describing their products as ‘chemical free’. Yesterday, we spotted that someone had not only beaten us to it, but done a far better job than we could have in summarising how we see the situation. We know it’s an easy mistake to make in passing – we’ve no doubt done it too – and we’re generally – but not always – quite forgiving of it. We can also make an educated guess at what is intended: ‘free from chemicals’, to people who use the expression, might mean free from the kinds of chemicals which have a poor reputation among natural and ‘free from’ skincare lovers and users, and which tend to be used only by the high street brands, and many of the upmarket or fashionable brands. Petrochemicals, SLS, parabens and so on. Or … do they mean free from ‘toxic’ chemicals? Well, if so, one could ask what is meant by toxic? Poisonous? Damaging? One molecule of cyanide won’t kill you; several pints of water drunk in quick succession might well. It’s a question of dose: an ingredient isn’t toxic, unless administered at a certain level, specific to that ingredient. We have regulations in place – though many would argue they don’t go far enough – to protect against skincare and food ingredients being used at toxic levels. Many ingredients can be used only at certain concentrations for this very reason. Or do they mean free from ‘unnatural’ chemicals? Well, some petrochemicals could arguably be described as natural … Or is free from ‘synthetic’ chemicals the intended meaning? Or perhaps ‘artificial’ chemicals? Or … We could go on. The point is that different people may use ‘free from chemicals’ to signify different things – and that’s a problem which is to be expected when terms are, strictly speaking, misused. The consumer is potentially confused, and the term has no clear meaning. Because much of our work involves allergies and intolerances, and many of our readers – especially those who come to us via our Foods Matter site – have sensitivities, we often get to hear of skincare products claiming to be ‘allergy free’. Again, sometimes, we can guess what their manufacturers are trying to say: that they’re free of all the 14 key food allergens, perhaps, or that they’re free of all 26 fragrance allergens which must be declared on labelling, or that the products are hypoallergenic. Sometimes it’s clear, but sometimes we do struggle to work it out … And hypoallergenic doesn’t mean ‘allergy free’ anyway – just that the manufacturer has taken steps to not use common allergens. Can anything be accurately described as ‘allergy free’? Water, perhaps. Salt too. You can’t be allergic to something your body needs – such as a vitamin. But the body can be allergic to any protein component – and most natural / botanical skincare products have proteins in them. The exception, perhaps, is a pure oil or oil blend – although many come with fragrance allergens, and may cause reactions, or just not ‘suit’ certain skin types. There’s always mineral make-up, I guess – is that always allergy friendly? Perhaps a passing chemist can enlighten us? And because very little is allergy free, you could say that very little could or should be described as ‘free from nasties’ – another expression we see quite a bit. We know there are some ingredients that arguably do not belong on anybody’s skin, but for many others, what is nasty to one person may not be nasty to another – just like a peanut may kill one and be a good source of nutrition to another. Opinions differ too: some dislike phenoxyethanol, and some don’t mind it. Who has the final say on what is ‘nasty’ in ‘free from’ skincare world, and what is not? We are guilty here too. But, sometimes, you do need a shorthand. We have a directory of skincare products ‘Free From Undesirable Ingredients’ – a more acceptable expression than, for instance, ‘Free From Ingredients Some Users May Find Undesirable’. It’s not easy when you’re trying to find a way of summarising all the reasons different consumers may avoid certain ingredients – they could be for health reasons, for ethical reasons, for environmental reasons, for religious reasons, for allergy-related reasons … and there are surely more. We’ve not found a succinct way of defining ‘free from’ skincare, unfortunately. I guess, at the end of the day, we just like to see specificity in ‘free from’ claims. What, exactly, are you free from? We’re not demanding that you be ‘free from’ every questionable or potentially allergenic ingredient – we just would like you to tell us exactly and specifically what you keep out of your products, or else whose standards you live up to – so that those who do have to or want to avoid certain named chemicals or ingredients can easily do so. If skincare manufacturers can tell us that – then we can tell our readers!